HS Girls' Basketball vs Cleveland. Game time is 2:00 PM EST. HS Girls' Basketball vs Rhea County. Game time is 6:00 PM EST. HS Girls' Basketball vs GPS. Game time is 5:30 PM EST. HS Girls' Basketball vs Baylor. Game time is 4:00 PM EST. HS Girls' Basketball vs Macon County. Game is being played at Lipscomb Academy. HS Girls' Basketball vs Meade County. Girls' Basketball team wins by forfeit. 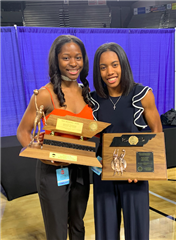 Congratulations to 2019 Miss Basketball Award Recipient Dontavia Waggoner and Miss Basketball Award Finalist Kaiya Wynn. The Tigers defeated Brentwood Academy 48-42 to win the 2019 TSSAA Division II AA State Championship. Ensworth finished the season with a school record 29 wins. Congratulations to Head Coach Mary Taylor Cowles, Assistant coaches Chris Brian and Krystle Horton, and all the Tigers on an outstanding season. Mary Taylor Cowles is the Head Girl's High School Basketball Coach at Ensworth. She also serves as Assistant Athletic Director. She attended Western Kentucky University where she played college basketball for four years. After graduating college, Mary taught in the public school system at the secondary level for two years before returning to 'the hill' (Western Kentucky University) to join the women's basketball coaching staff. She served as the Recruiting Coordinator from 1994-1997, Associate Head Coach from 1997-2001 and Head Coach from 2002-2012. During her head coaching tenure, Cowles was named Coach of the Year 3 times, served terms on the NCAA Kodak All-American Selection Committee, as the Sun Belt Conference Captain, and served on the NCAA Division 1 Legislative and Issues Committee.